For obvious reasons, I’ve been obsessing about India and Pakistan for the last two days. To use the language of Joe Biden, it looks like Pakistan will be Obama’s first big foreign policy “test.” We don’t know whether the terrorist attacks in Mumbai were sponsored by the Pakistani intelligence services or not. But there is a sense in which this question is irrelevant since it’s clear that whatever the origins of the terrorist might be, the intent of the attacks was to strain relations between Indian and Pakistan, and also to punish India for its closer ties to the United States. Last month, right before the America election, I went to MIT where I gave a series of talks on comics. The main event was a session where Ho Che Anderson, Diana Tamblyn and I talked about the relationship between politics and comics. 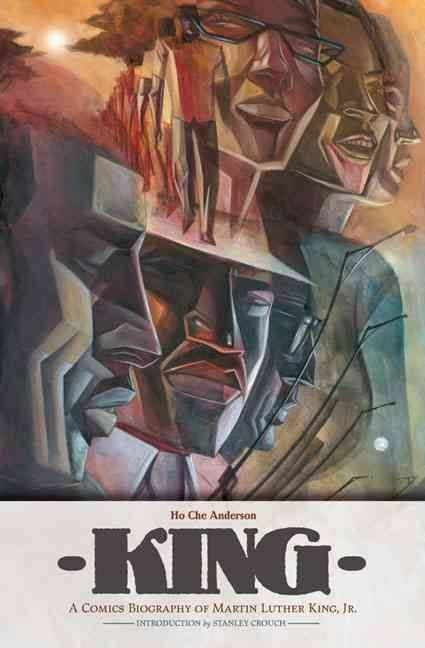 Ho has done many celebrated graphic novels and comic books, including a long biographical book on Martin Luther King. Diana has done some very fine mini-comics and is now working on an ambitious graphic novel about Gerald Bull, the Canadian scientist and arms dealer who was assassinated in 1990 (most likely because he continued making weapons for Saddam Hussein after it was no longer politically correct to do so). Thanks to the miracle of modern technology, you can hear our talk by going here. 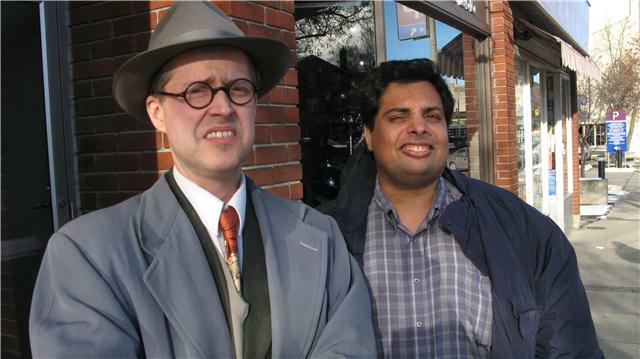 A Dapper Seth and a squinty Jeet. For all his interest in fiction’s ability to tell the truth about the world, there is something remarkably self-enclosed about his criticism–a sense that nothing exists beyond the boundary of his consciousness, and that his consciousness contains nothing but books. In a preface to the new work, Wood assures us that he has used “only the books I actually own—the books at hand in my study” to produce the volume. The statement is truer than he knows. Wood has read all the novels and all the volumes that bear upon the novels, and he seems to think that is all one needs to do. But there is a world outside his study, and the books in his study, and one can’t understand fiction without understanding that. The novel, more than other literary forms, embodies a massive engagement with the world—has massive designs upon the world—and demands a comparable engagement from its critics. Deresiewicz makes many other thought-provoking criticisms of Wood and, by extension, of the cultural moment he takes Wood to represent. I can’t recall the last time I read such an eloquent defence of political criticism. Irving Kristol famously said that a neoconservative is a liberal who has been mugged by reality. Tom Wolfe neatly inverted this ugly sentiment by observing that “a liberal is a conservative who has been arrested.” We can see the wisdom of Wolfe’s statement when we consider the case of Conrad Black, a very conservative tycoon who now finds himself in prison. The experience is starting to turn Black into not just a liberal but something of a radical. In an essay reprinted in the Times of London, Black eloquently critiques America as a “carceral state” where the legal system is stacked against defendants leading to an amazingly high percentage of the population being jailed. John McCain, trying to fake a smile. 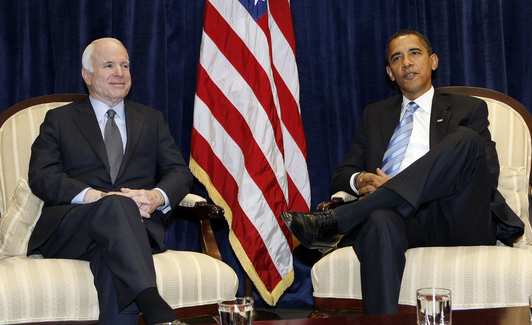 Obama met with John McCain earlier this week: a magnanimous gesture that turned into an awkward event. If you look at any of the photos or videos from the event you’ll know what I mean: McCain was squirming throughout, like he was about to be recaptured by the Vietnamese. When I saw the pictures of the meeting, I thought, there’s something going on here. It’s not just partisanship or McCain being a sore loser. Other politicians are similarly made awkward around Obama. I’ve seen that McCain squirm on Joe Lieberman’s face as well. As Stephen Colbert has noted, whenever Bill Clinton forces himself to say the name “Barack Obama” he looks like he’s passing a kidney stone. Thousands of American lives and hundreds of billions in taxpayer funds have been expended to provide Iraqis the opportunity to live freely. And this despite the facts that (a) the U.S. interest in Iraqi democracy remains tenuous (our interest was the elimination of Saddam’s terror-mongering, weapons-proliferating regime), and (b) Americans were assured, when the nation-building enterprise commenced, that oil-rich Iraq would underwrite our sacrifices on its behalf. Yet, to be blunt, the Iraqis remain ingrates. That stubborn fact complicates everything. It doesn’t take a genius to figure out why the Iraqis might be “ingrates” (thousands tortured, hundreds of thousands dead, millions turned into refugees).